The next book from my new publishing company, Shadowpaw Press, through which I previously published my short-story collection Paths to the Stars, will be something quite different. 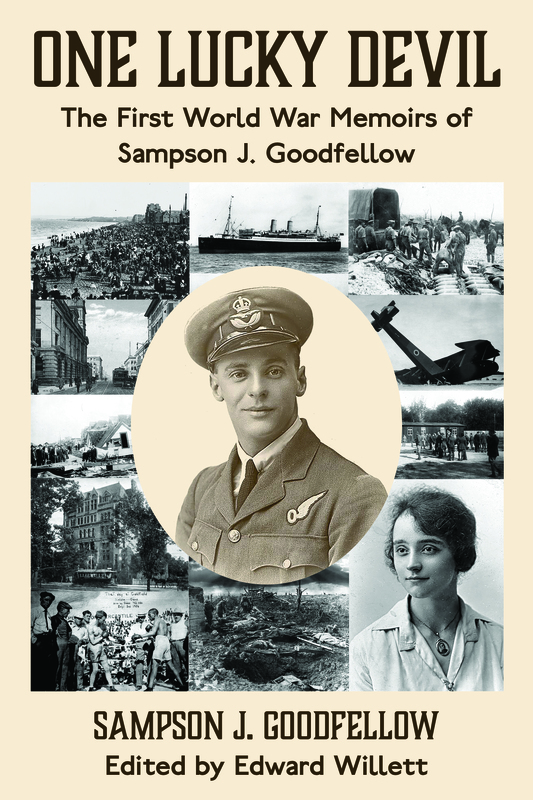 One Lucky Devil: The First World War Memoirs of Sampson J. Goodfellow is the edited memoir of my grandfather-in-law, in whose former house I now live (having married his granddaughter, Margaret Anne Hodge, P.Eng. Sam wrote his memoirs late in life, probably in the early 1970s (he died in 1979). I posted them online here, unedited, about ten years ago, but with this being the centennial of the signing of the Armistice that ended the First World War, it seemed an opportune time to put them into book form, properly edited, with some accompanying photos (there aren’t a lot from Sam himself, but there are quite a few that illustrate places and events). Release date is November 1! You can already pre-order the Kindle version here, and the print version is in the final stages. I hope you’ll check it out when it’s available! Born in Scotland, Sampson J. Goodfellow emigrated to Toronto as a child. Like many young Canadian men, he returned to Europe to serve his new country in the First World War, first as a truck driver, then as a navigator on Handley Page bombers. Over a span of just six years, Sam witnessed Canada’s deadliest-ever tornado, sparred with world-champion lightweight boxers, survived seasickness and submarines, came under artillery fire at Vimy Ridge, was bombed by German aircraft while unloading shells at an ammunition dump at Passchendaele, joined the Royal Flying Corps, was top of his class in observer school, became a navigator, faced a court-martial for allegedly shooting up the King’s horse-breeding stables, survived being shot down by anti-aircraft fire, was captured at bayonet point and interrogated, became a prisoner of war in Germany…and, in the midst of all that, got engaged. When Sam was listed as missing, the family of his fiancée went to a fortuneteller for news of his fate. “You couldn’t kill that devil,” she told them. “He is alive and trying to escape.” She was right. Sampson J. Goodfellow really was “one lucky devil.” This is his story, in his own words.